The recent announcement of a study showing a correlative link between the loss of biodiversity and the decline of human cultural diversity (specifically of local languages) reminds us once again that studying biodiversity is more than just about discovering how many species there are in different geographical locations and how they can be conserved. The remit of biodiversity covers all levels of biological organisation, from genes to species to ecosystems, including the human species and those ecosystems we have created for ourselves. Not only that, biodiversity is also about why species occur where they do and how they have adapted to their local conditions, including interactions with the other organisms that shape their ecology and evolution. Plants and pollinators are a good case in point: if there is not a suitable size or morphological fit between flower and animal, the animal will not be able to obtain its reward and the flower will not receive pollen. Both immediate ecological context (which species are present in a community?) and longer term evolution (how have these species adapted to one another?) are important in this regard. These thoughts were very much on my mind as I sat uncomfortably on a rectangular toilet seat in a very swish hotel in Switzerland last week. There’s a reason why toilet seats are usually curved: it fits the usual shape of our arses. Rectangular toilet seats are not well adapted to their role and do not work effectively: they are uncomfortable and a victory of Swiss style over human functionality. The same applies to the convex saucers on which breakfast coffee was served. They were the anthithesis of biological adaptation where the stylish patterns of a butterfly’s wings, say, have evolved for a purpose (display and/or camouflage) rather than to look pretty. Karin and I were in Switzerland at the invitation of Nadir Alvarez from the University of Lausanne. Nadir and his group are using the latest molecular techniques to carry out fascinating research on species interactions and patterns of phylogeography, including work on one of my favourite groups of plants, the genus Arum. At Nadir’s request I gave rather a broad talk on the theme of the ecology and conservation of plant-pollinator interactions in highly managed landscapes, focusing on the work that members of the LBRG have done in Northamptonshire and adjacent counties. The questions afterwards suggested that it generated quite a lot of interest in the audience of about 50 faculty members, postdocs and research and MSc students. Before and after the lunch hour talk I spent time chatting with postgrads and staff about their research projects, moving from office to office in a carefully Swiss-timed fashion, always conscious that outside each window were fantastic views across Lake Geneva to the snow crowned Alps beyond: “You forget it’s there after a few weeks” claimed one postgrad. Lausanne is a lovely city which is enhanced by the human-contrived biodiversity of planted roofs, green walls, and public green spaces. 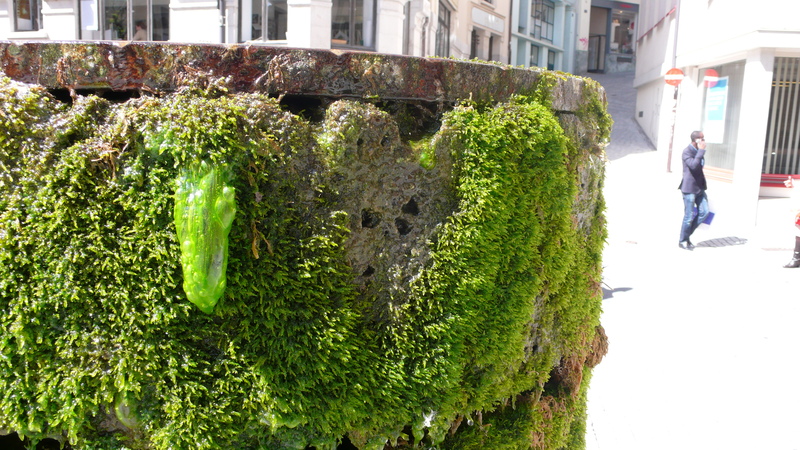 And by the species which naturally colonise suitable habitats, such as the moisture loving mosses and algae which have found a home in the stone and steel fountains designed by Georges Descombes in La Place de la Louve. Back in Northampton late Friday night, then up early Saturday morning to prepare a talk for the local branch of Friends of the Earth’s Bee Cause campaign launch. It was the usual general over view of what pollination is, why it’s important, why pollinators are declining etc., etc. I pointed out at the start that the public audience (once again of about 50) were getting a free taster of what, from September 2012, our students will be paying £8,500 per year to listen to. They seemed to enjoy it and had some interesting questions afterwards, though one guy claimed my talk was too long and “a bit like being in church”. This was the same individual who asked me whether “wasps and nettles can sting each other” which perhaps gives an insight into his world view. Back at the coal face of university life this week, however, the dominant theme has been marking student work. Lots of of it, as we work to get final grades into the system prior to exam boards in early June. A pile of about 90 first year reports on woodland community structure, based on field work we carried out last autumn, has been hard work but in many ways enjoyable. Some of these students have done very well and really engaged with the aims of the assignment. Quite a number independently found a recent study on the importance of rot holes in trees for maintaining epiphytic lichen diversity. Has anyone looked at this in British oaks? It would make an interesting final year student project. Which brings us back to the links between biodiversity and human culture, because lichens have been used for millenia as sources of pigments for painting, for example in illuminated Saxon manuscripts such as the Lindisfarne Gospels. 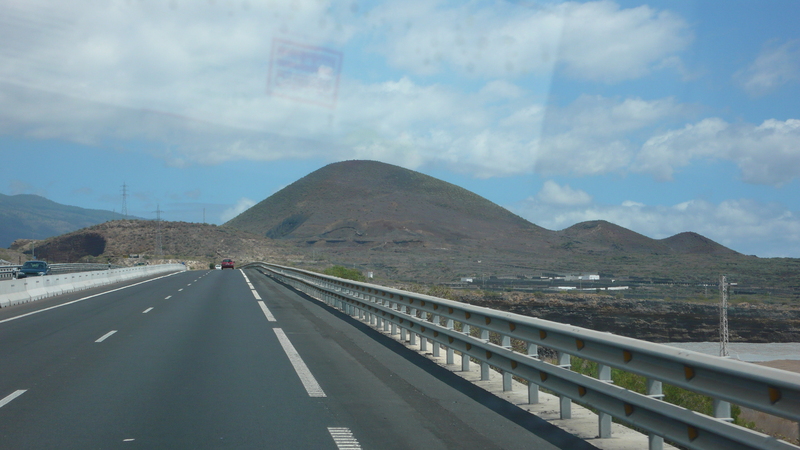 During our field trip to Tenerife the two vehicles covered over 900km each, which is not bad on an island only about 80 km in length along its main axis. We experienced temperatures that ranged in one day from a few degrees above freezing to the mid 20s centigrade. Up in the laurel forest I mentioned last week the weather was cold and foggy, whilst in the Malpais de Güímar it was hot and dry and we sunburned. We put in long, tiring days of walking transects, identifying, measuring and recording plants, and observing bee and bird behaviour. And there were ticks that had to be picked off skin in one of the barrancos we visited. The Romantic Adventurer within me would therefore like to believe that the aching limbs and upset stomach I suffered when we got back to the UK were due to some exotic virus passed on by these blood sucking arachnids. However the Cynical Traveller thinks it was more likely to be due to a hamburger of dubious age and temperature that I ate at Tenerife Sur airport on the way home. The Tenerife Field course was hard work but great fun and I think (I hope!) the students learned a lot. At the very least they have now experienced just how diverse habitats can be on a small oceanic island. In that diversity rests both the beauty of Tenerife and part of its scientific interest. This variability in habitats is a result of its altitude (Tenerife is the second highest oceanic island in the world after Hawaii), subtropical latitude, climate, proximity to Africa, and geological history. In a single day one can travel from high alpine habitats, through sub-alpine desert scrub and pine forest, into succulent dominated low altitude desert scrub, back up to laurel forest (a form of subtropical rainforest), as well as distinct deep valley and strandline vegetation. Add to this the occasional hurricanes and forest fires that tear across parts of the island, not to mention volcanic eruptions, plus the human impact, and it makes for a rather dynamic environment at a range of time scales. These processes probably add to the overall biodiversity, as predicted by the intermediate disturbance hypothesis, plus formation of new land area can select for novel proto-species. It begs the question of whether volcanic oceanic islands are more diverse than their coralline counterparts, which we might expect to be less dynamic environments. Has anyone investigated this? That’s one of the things that keeps my interest in biodiversity going: there are too many questions for a single lifetime. I’m hoping that “Darwin’s Unrequited Isle” will take off as a new name to refer to Tenerife, replacing the Island of Eternal Spring cliché it currently holds (and shares with Madeira). Especially as many of the days we were there were spring-like only in the sense that they were wholly unpredictable. On the roof of Tenerife, in Las Canadas, our car thermometer registered 3 degrees centigrade at 1100am. And it snowed. I’ve never experienced that at this time of the year. We’ve had torrential rains storms but never snow. In late April. In the “Island of Eternal Spring”. I’m not complaining though, it all adds to the fascination of this most interesting of islands and is why we come back year after year. It’s also better conditions than my colleagues Duncan McCollin and Janet Jackson endured with those students who elected to do field work in Northamptonshire rather than Tenerife. For most of the time we were away it poured with rain back home, turning the drought-imposed hosepipe bans into flood warnings in some places. Needless to say, the day of the snow was the day we were due to make some observations of bee behaviour. By and large bees don’t like snow and low temperatures ground most of them. So that planned activity was delayed until later in the day when it finally warmed up sufficiently for them to start flying. This theme of variability in the weather, on a day-to-day basis and compared to previous years, was a recurring one all week. Tuesday was hot, as I recounted in my previous blog. But Wednesday was a huge contrast as we headed up into the cold, wet laurel forests of the Anagas Mountains. It’s always a little chilly on this part of the island due to the prevailing moisture-laden trade winds, but this year was colder and foggier than I can remember. The students collected data on the distribution of plants up a vertical cliff face that we can compare to similar data from another site collected last year. I’m intrigued by the way succulent plant groups such as Aeonium and Monanthes are able to survive on these water limited, nutrient poor environments, vertical versions of the desert scrub lower down the mountains. These succulents add to local plant species richness within the forest and provide nectar and pollen resources when they flower, increasing the overall levels of biodiversity of an already diverse habitat. As well as studying plant diversity we also did some work with the animals of Tenerife. The bees I’ve already mentioned, but for the first time we also made some observations of how bird behaviour changes in tourist areas compared to more isolated spots. Even within a very short distance, no more than a few hundred metres, it’s clear that bird diversity, abundance and range of observed behaviours were greater in the areas where tourists congregate to barbecue and relax. We did some similar work with lizards for a few years and found that they were bolder close to tourist car stops than further away. Humans can impact the life of this island in very subtle ways. We also spent a morning with volunteers from the Atlantic Whale Foundation (AWF) on one of their trips out to record individual whale and dolphin activity off the south west coast. The AWF piggy backs on one of the commercial whale watching boats and the students are encouraged to think about the synergies and tensions between the conservation-motivated scientific observation of the AWF and the commercial motivations of the tourist boats. It gets to the heart of what “eco-tourism” is all about and the point at which it does more harm than good. The only strong opinion that I have about it is that the value of eco-tourism is context dependent; some activities are better than others in some circumstances but not others. Regardless, the trip is always popular with the students (except one year when a student spent the whole time aboard with her eyes closed, suffering chronic sea sickness) and this year was exceptional, with great views of bottle nosed dolphins and pilot whales, as well as long distance spottings of common dolphins and a 20m fin whale. The final day of the trip, prior to getting to the airport, is traditionally spent at the Pyramids of Güímar ethnographic park where the students discover some of Thor Heyerdahl’s left field views about possible pre-Columbian links between Canarian, Mediterranean and New World peoples. Whatever the truth behind the origin and function of these enigmatic structures, the visit is a pleasant way to end the field course. Nestled within the protective bowl of the Güímar Valley, I often wonder if it’s a coincidence that the Güímar structures look out towards the three cinder cones adjacent to the Güímar Badlands. Approaching from the south along the TF1 road, these hills take the form of a heavily pregnant woman lying on her back. Was it of symbolic significance to the ancient Tenerifeans in the days prior to the Spanish conquest? I like to think so though we probably will never know. A small grant from the British Ecological Society means that I’ll be back in Tenerife at the end of May for ten days to do some follow up field work. Hamburgers will be avoided.